In all fairness, it’s widely accepted that there was a giant impact around 65 million years ago, and it’s widely (albeit not universally) believed that this event killed off the dinosaurs in the Cretaceous–Tertiary extinction. While it’s been hypothesised that other impacts may have been responsible for certain other mass extinctions in Earth’s history, Nathan Kaib and Thomas Quinn of Washington University are evidently not so sure. The two have run some numerical simulations to investigate long period comets. Long period comets are those which come from the very edge of the solar system. Loosely bound by gravity, the Sun is thought to be surrounded by the Oort cloud — a shell of icy objects. A nearby star passing too close can perturb these cosmic snowballs, causing them to fall towards the Sun and flare into brilliant comets as they start to warm up. If these errant oort cloud objects aren’t flung into interstellar space, they can fall into huge elliptical orbits, orbiting the Sun on timescales of thousands to millions of years. Although it was long believed that the outer reaches of the oort cloud were the main source of such long period comets, Kaib and Quinn’s simulations suggest that the actual source is the inner oort cloud. There’s a big difference there. A couple of light years of difference, in fact (the outer oort cloud is believed to stretch as far as three light years away from the Sun!). A close encounter with another star can still cause a shower of comets from here — though even without such a gravitational nudge, it was still found that most long period comets come from the inner and not the outer oort cloud. 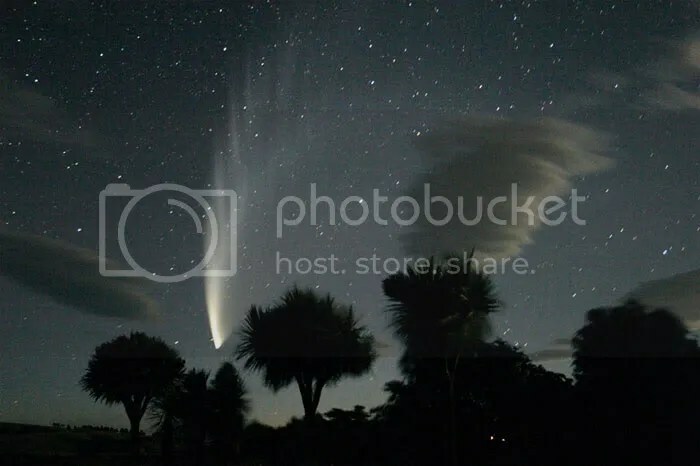 Image: Comet McNaught, reproduced with kind permission from Chris Picking of Starry Night Skies Photography. His pictures are great. You should go and look at some more! This entry was posted in Imported from Livejournal and tagged astrophotography, comets. Bookmark the permalink.